@ Suzanne Roberts Theatre, 480 South Broad St. In these trying times, now more than ever, we need to feed our spirits with joy and artistic experiences that lift our spirits, teach critical history (in this case, trailblazing African-American women), and fill us with hope and inspiration. 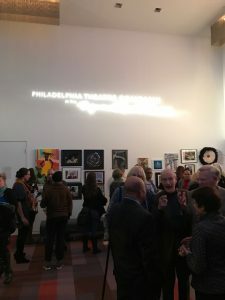 Our partnership with Philadelphia Theatre Company (PTC) does just that! We have seen the play about the Delany sisters, and it’s a winner! Plus, we have an array of fine art brought to you by artists of the Mt. Airy Art Garage (MAAG) that speaks to their personal interpretation of “Having Our Say.” At the opening night of the show, we found theatregoers spending time truly absorbing what they see, talking to the artists, sharing thoughts and conversation. 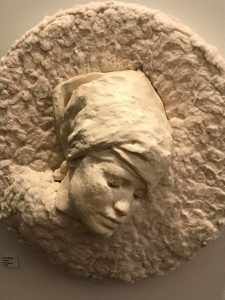 This show will be in Center City, at the Suzanne Roberts Theatre, through Feb. 19. We are excited to exhibit work reaching new audiences in a truly new and inspiring theatre! We are also thrilled that PTC is providing tickets AND a bus for the children of MAAG’s Community of Pride Mural Project at Emlen and Houston schools to see the play and exhibition. We’re not sure who is more excited — the kids or the teachers. We especially hope you will attend today’s opening. We are intentionally nestled between both matinee and evening performances. The exhibition is free. 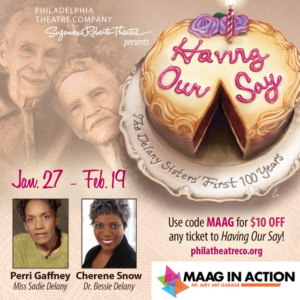 And if you attend the performance you will get $10 off your ticket if you use the code MAAG. But, if I were you, I would bring my friends and family and make a day of it. We’ve done precisely that, and it’s a winner! It’s an amazing way to spend an afternoon or evening, and guaranteed to lift your spirits, teach (as you learn more about the Delany sisters), and feed your soul. The Mt. Airy Art Garage continues to deepen our involvement with new and exciting partners. That’s part of #MAAGPopsUp and our new way of thinking while we await the buildout of our new 2018 space. You can visit our flagship location at 6622 Germantown Ave.— our exciting new handcraft gift shop. You can also reach us at 215.242.5074 or mtairyartgarage.org. Stay tuned as MAAG moves forward!